Good morning fiber lovers! While we’re sitting on some news (which we will share with you next week), we wanted to take a moment to talk about harvesting fiber from our rabbits. PETA posted a “call to action” on their website in 2013 to boycott products made with angora wool, and for good reason. Commercial producers overseas view their rabbits as “stock”, not as living, breathing creatures. They certainly don’t view the rabbits as part of their family. Some of the things we’ve seen are atrocious and heartbreaking. If there was a way for us to swoop into those rabbitries and save all the beautiful fuzzy souls there, we would. However, since we are unable to do that, what we can do is to ensure that our rabbits are treated with the dignity, respect, and love that is dictated by common morality and humanity. Or “rabbitity”. That’s not a word, according to spell-check, ,but it might be time to introduce it to the Oxford Dictionary people. Regardless, there are two common methods for harvesting wool from rabbits. Since we have both English/French and German angoras, we utilize both of those methods. The English/French rabbits have what’s known as an “asynchronous” coat. Anyone with any sort of medical knowledge knows that the prefix “a-” means “not”, and it applies here as well. The fur on the English/French rabbits grows at different rates. While yes, we could shear them, we’d end up with a lot of wasted wool, because the staple lengths would be wildly different throughout the coat. So instead, we “pull” or “pluck” their fur. Now, before you dig out the torches and pitchforks and start your online petitions, there is a very important caveat to pulling: the fur that we pull isn’t attached to the rabbit. If you own a dog (that sheds), you’ll know exactly what we’re describing. That loose fur that’s being held in place by the surrounding fur… it’s itchy and irritating to your dog, now imagine how uncomfortable it would be for a thin-skinned creature like a rabbit. Here’s a quick video from YouTube that shows a lady harvesting fur from one of her bunnies. You’ll see that he rabbit is just sitting there, and most likely, is enjoying being rid of that excess fur. 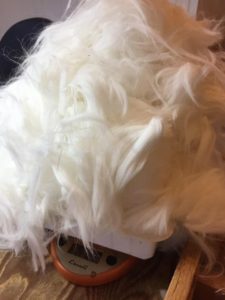 There are other methods of removing this molted fur like brushing or combing, but in order to ensure that all the fur can be used for yarn, pulling (or plucking) is the best, and easiest, way to do it. Which brings us to the German angoras. They have what’s known as a “synchronous” coat: all their fur grows at the same rate, and unlike the other angora breeds, they don’t shed. This means that the German angoras must be sheared. While shearing methods can vary wildly worldwide, we follow IAGARB‘s recommended procedures, which work well for the IAGARB breeders world-wide. 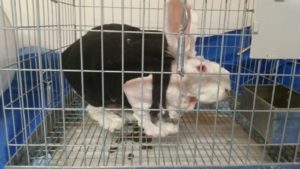 Is shearing risky to the rabbits? Of course it is. It’s just as risky as shaving, or getting a “high and tight” hair cut. We use supercharged trimmers that have very sharp blades. But as the rabbits grow more and more comfortable being handled (remember, they are prey animals, and don’t trust very easily), they will get to the point that they look forward to getting rid of all that fur. It is warm, after all! Once all the fur is shorn from the rabbit, they are suddenly naked! And yes, they look really funny, especially when you’re used to seeing a massive mountain of pure white fluff. There is still some “aftercare” to be done to ensure the rabbits stay healthy and happy. Depending on the temperature, some breeders will give their rabbits some time to “get that itchy spot” that’s been driving them nutty for the last couple of months (try to scratch an itch through a wool coat and tell me how that works out for you…)! Regardless of the season, all the shorn bunnies get coats. Really nice, warm, soft fleece coats, like Hillside’s Gertrude (photo on the left) did last weekend at the District 7 Certification. For her trouble, Gertrude got to hang out inside for awhile in a temporary cage, and she got a lot of skritches and love from the other IAGARB members who were there. Yes, she looks funny, but believe it or not, that is one of the happiest rabbits you’ll ever see. Photo courtesy of R. Truong. Another IAGARB member in the US’s Midwest region just sheared a couple of her rabbits. What you see to the right is the result of that shearing: nearly a full pound of thick, luscious fiber. To be fair, this is an extraordinary amount of fiber, but that comes from years of excellent breeding and high IAGARB standards. The doe that this fiber came from was also allowed to get that itchy spot, and a comfy warm fleece jacket. And skritches and love. Regardless of the methods of removing the excess fur from these beautiful bunbuns, so long as it’s breed-appropriate, and done gently and carefully, this is the best thing for healthy, happy rabbits. And while, yes, all the pedigreed rabbits have numbers, they also have names. They are a part of the family, not just wool-producing machines. They are not mishandled or abused. So while PETA’s heart might be in the right place, please don’t assume that all angora wool comes from neglected or abused rabbits. When you find angora that’s locally grown and harvested, none of the breeders we know mistreat their rabbits. We certainly don’t. An animal is more than inputs and outputs, more than a “product”.